LMAO. 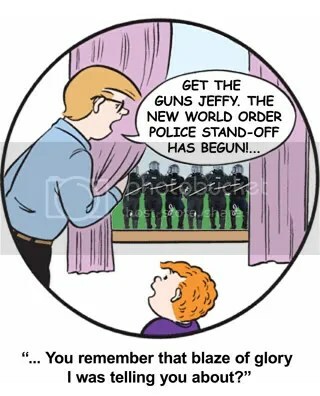 I love how the little boy is suggesting Death By Cop as an option. This entry was posted on June 16, 2009 at 4:11 am and filed under Alex Jones,Barack Obama,black helicopters,comedy,comics,conspiracy theory,culture,entertainment,illuminati,new world order. You can follow any responses to this entry through the RSS feed.